Good morning beautiful people. I apologize for my absence. I have entered a busy season and I sure do miss you all. I pray that everyone has had a blessed week thus far. I send prayers up for everyone who has returned to school and to those who will be returning next week. I decree and declare that you all will excel in areas that you use to struggle in and I speak peace over your lives. May God continue to bless you and keep you! During my morning devotion, I began reading Psalm 139 and verse one jumped off the page and resonated in my heart. I was temporarily paralyzed by the nine words that stared back at me. I was at a lost for words and I couldn’t even force myself to read any further because immediately I began recalling who I was and who I am becoming. The scripture says, “O Lord, You have searched me and known me.” There are things about me, Nicole Ellis, that my parents don’t know, that my husband doesn’t know, that my children don’t know, that my closet friends don’t know and to think that God took time to search me and knows my deepest most inner most thoughts. He knows things from my past, present, and my future and yet He still loves me. That blew me away! There are people who barely know me now and based on their false perception of me won’t even deal with me. Now imagine how people would treat me if they knew every indiscretion that I ever had. Imagine the looks I would receive if people could see my sin on a flat screen Tv. Take a moment and think about how many friends you would have if they knew what you did or what you currently do? Not too many, huh? This is the reason why I couldn’t push myself to read any further. This is the reason why I couldn’t open my mouth to speak because for a moment I began thinking about how man would treat me if they only knew my past. I began thinking about how people treat me now and they have no idea who I really am and for a split second I compared GOD to man. I couldn’t understand why God would treat me any differently. Then tears filled my eyes and I realized that God searched me and He knows every thing I ever did, ever thought about doing, ever said, and yet He still loves me. God knows every single thing about me and He still sent a Savior to save my soul. NOW THAT’S LOVE! You see, man will judge you, place you in a box, ostracize you, ridicule you, condemn you and leave you by the waste side for the smallest indiscretion, but God, the One who knows every single thing about you looks past your faults and loves you without limits. Who wouldn’t want a love like that? I grow deeper in love with Christ because I realize that I can come to Him as I am and I don’t have to hide anything from Him because He loves me. I desire to become a better child of God because He knows me and yet He still loves me! I pray that you continue to seek God daily and grow to love Him as much as He loves you. Have a blessed day! It was God’s Grace, not your works. Good afternoon beautiful people! This is the day that the Lord has made, choose to rejoice and be glad in it!!! I am choosing to rejoice. Grace is defined as the state of being protected or sanctified by the favor of God. Oh, I love how that reads. Let me help someone out, it is by the mere fact that God chose to protect you and sanctify you with His favor that you have been saved (period). I could stop the blog right there, but allow me to continue for a moment. Children of God, please stop thinking that you did anything special to get into the kingdom of God. Stop walking around with your chest puffed out and your nose stuck up in the air, acting like you were the elite few selected to be saved. The scripture says, just because God is who He is, not because of anything that you did, you are saved! So stop boasting! It was God’s grace, not your works! As Christians, we are representatives of Christ. We should lead people to the cross and not think that we are the One who saves, rather we are ambassadors who can lead others to the One who saves. We have to lead with a humble heart and know that we are powerful because of Christ, but we are not Christ. One of the most damaging things in the kingdom, is a bunch of believers who think they have arrived and are mini-gods. Some believers walk around as if they are living, breathing, walking organisms of perfection. But my bible tells me in Romans 3:23 (NKJV) “ for all have sinned and fall short of the glory of God.” Stop boasting, your good deeds are not why you are saved. You are saved because of God’s grace and the fact that you had faith in Him. Take time out of your day and give God honor for His grace. Remember, you didn’t do anything to warrant salvation, it was because God wanted to protect you and sanctify you with His favor that you are saved. I don’t know about you, but I’ll shout to that. If you are boasting about your good works, please stop. If you are not boasting about your good works, please don’t start. Remain humble and know that God’s grace saved you! If you want to boast about anything, tell people about how God’s grace saved your life! Good morning! Happy Monday to you all. I pray that you had a wonderful weekend. It’s raining here in the 757, but the SON is still shining. Life is about perception. You can turn a negative into a positive, if you just believe! He shall preserve your soul. 8 The Lord shall preserve your going out and your coming in From this time forth, and even forevermore. I recently have been embarking on a journey of the book of Psalm with some awesome people who provide some helpful feedback and insight on the chapters. Today we are on Psalm 121 & Psalm 122. I’ve read the book of Psalm before, but this time God has given me new insight for this season that I’m in. Oh, how I love this chapter. God has been showing me, the more I grow spiritually, the more my spiritual understanding will improve and it is necessary to go back through the chapters as often as possible. Do you know where your help comes from? If not, then read Psalm 121. This chapter reminds us that ALL of our help comes from the Lord. Not some of our help, but all of our help comes form the Lord. 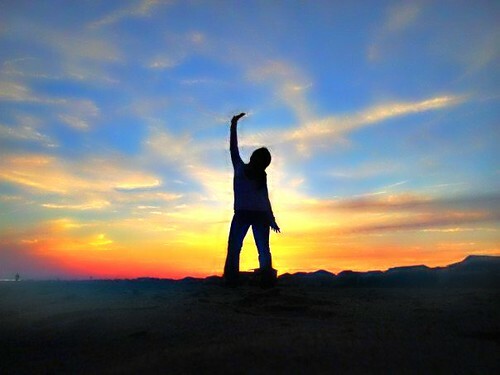 When you are going through, don’t hold your head down, lift up your eyes to the hills. Look up to the source of your help. You have to remember that your help doesn’t come from man, but it comes from the Lord. The Lord is the source of your help. Don’t get me wrong, the Lord can and will use man to carry out His will for your life, but they are just a means to the help, but God is the source of your help! Where does your help come from? I know that All of my help comes from the Lord. I am so glad that the Lord doesn’t slumber or sleep, but He is available 24-7 to keep me, preserve me, to help me, to protect me and so much more. Man is not available 24-7 because they get tired and they get tired of you. Our patience runs thin, and sometimes we get tired of helping especially if we feel like we are being taken advantage of, but not God. He helps anytime because He is the source of our help! Aren’t you glad that God is the source of your help? Aren’t you glad that you can call on Him at anytime? Aren’t you glad that God doesn’t limit how often or how much He helps you? I don’t know about you, but I am! Remember to look to the hills when things are going right and when they are going wrong. Remember to put your trust in God and not in man. Remember that all of your help comes from the Lord. Good afternoon! This is the day that the Lord has made, choose to rejoice and be glad in it. This morning, I popped in an old worship cd and began listening to a song called “He’s great”. The song says, “The name of the Lord is great (repeats), and greatly to be praised. The name of the Lord is a strong tower, the righteous run in and are saved. Great is the Lord and greatly to be praised, now henceforth forever and always.” The song is a simple song filled with repetition, but it’s so powerful because it causes you to focus on how great God is. They repeat, “HE’S GREAT!” over and over again as a statement to all who will listen. God is great!!! I get so hype off of this song because those two little words, “HE’S GREAT!” can change your entire disposition. Below are a few scriptures that highlight God’s greatness. He’s great because he made the earth!!!! God is great!!! Do you realize that you wouldn’t even be here if it weren’t for the GREATNESS of a MIGHTY GOD???? All things are possible with God. God has no limitations. Man can only do so much, but God can do all things. He’s Great!!! 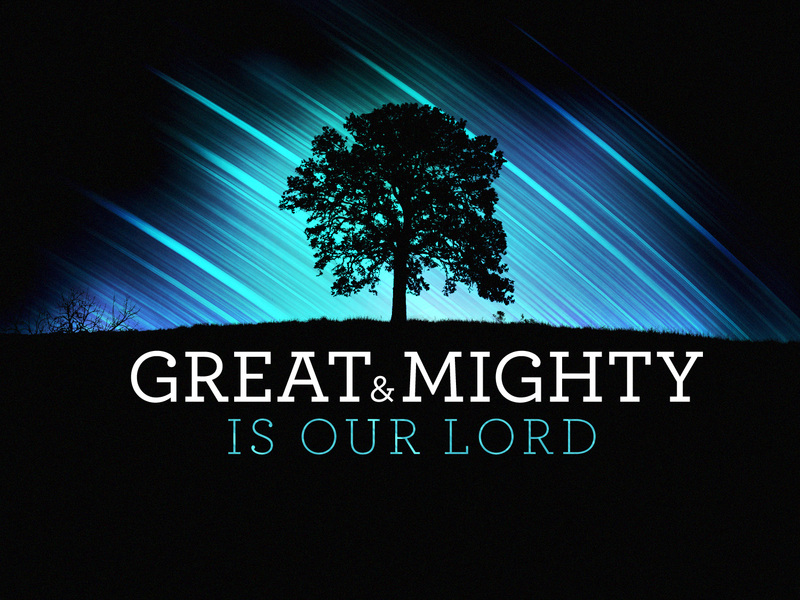 God is the Mighty One, who will stand with you, protect you, guide you, save you and so much more. He’s Great!!! God sent His Only Son to become flesh and to dwell among us. Jesus died for our sins and lives because of God the Father. You can’t tell me that God is not Great! He is great because He could have wiped us off the face of the earth, but His grace and mercy moved Him to send us a Savior. He’s Great! It is so important to take time out of your busy schedules and marvel at how Great God is! It’s important to sit still long enough to reflect on how Great God is! Your situation may not be going the way you would like, but God is still great. You may not have the house, job, car, or finances that you want, but God is still great. You may not like how you look physically, but God is still great. You may not like what’s going on in your family, but God is still great. No matter what you are faced with, know that God is still great and you can praise Him for being a great GOD!!! I pray that you have a great day and take time to praise God for being so Great! Happy Friday! I don’t know about you, but I am so thankful that God carried me to another Friday. This has been an intense and busy week, but God is always right there to see me through. This morning when I woke up it was cloudy and dreary outside. It started to lightly drizzle and it even appeared that the sky would open up and rain would pour down. I stepped outside a few minutes ago and the clouds have rolled away and the sun has burst through the sky and oh how beautiful it is. When thinking about the presence of rain, I’m reminded that after the rain the sun shines ever so bright. 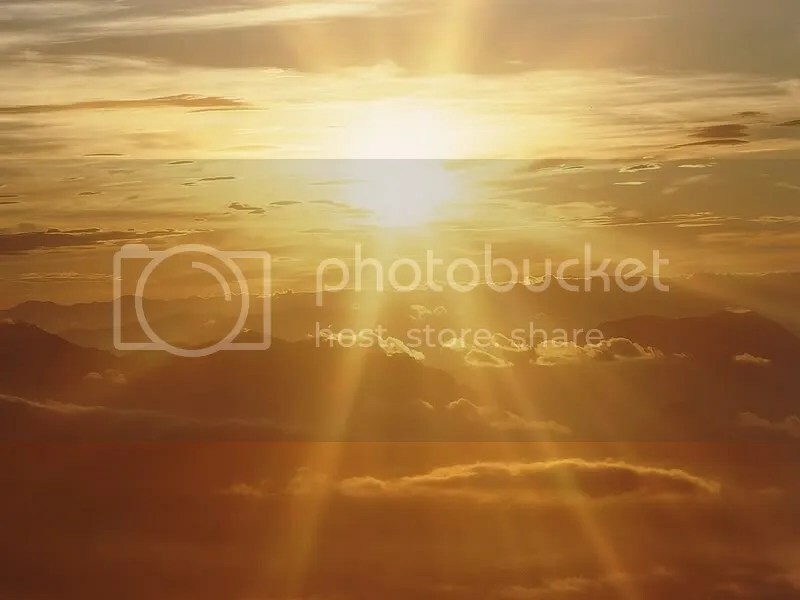 In our lives, we may experience some rain storms, things may appear like the clouds will open up and pour defeat over our heads, but after the rain, oh after the rain, the SON shines! When you are in the storms of life, try not to look at God and say “Lord, why are you allowing this to happen to me? or “Lord, why aren’t you here?” Remember that the storm you are facing had to go to God first, get His approval before it could come to you and when God signed off on it He already knew that you would make it through. Be encouraged today! We serve a God who causes the winds and the waves to obey His command and if God can make the earth submit to His command, He can make the storms you face submit to Him too! AFTER THE RAIN, THE SON SHINES BRIGHTER THAN BEFORE YOU ENTERED THE STORM!!! Rejoice! When your storm is over, you will have a brighter day! Have a wonderful weekend. God bless! Good morning! Thank God for a new day! Patience, anyone? We’ll I’ll take a double order of help me Lord, with a side of have mercy and please super size grace. This thing known as patience is no joke however it is a necessary part of life and it’s one of the fruits of the spirit. I love Galatians 5:19-22 because it tells us how we can inherit the kingdom of God and it also tells us how we can squander that inheritance. We must operate in the fruits of the spirit! Now, I’ve been trying to post this since Monday, but God being who He is delayed the post. Why? I’m glad you asked. Anytime you ask God for patience, He doesn’t just give you patience, He allows you to experience situations in which you have to demonstrate patience. So needless to say, I have been bombarded with these experiences. Let’s look at patience, it’s defined as “the state of endurance under difficult circumstances, which can mean persevering in the face of delay or provocation without acting on annoyance/anger in a negative way.” So basically, patience is how long you can go without blowing up or losing your faith. It’s the waiting period you must endure. Now in the New King James Version the word long-suffering is used in place of patience. Long-suffering is defined as “patiently enduring wrongs or difficulties.” How long can you wait without responding negatively while being mistreated or when dealing with difficulty situations? I told you, this patience thing is no joke, but there’s hope! God will never give you more than you can handle. One thing I’ve learned is some situations requires a quiet spirit. If you are put in a situation where you have to exercise patience and you feel like you are about to blow your top, the best thing to do is remain silent and begin to pray. Another thing I’ve learned is that while you are enduring difficult times or even being mistreated, focus your attention on the positive aspects and not the negative. Try to minimize your complaints. What you replay in your mind is what will eventually come out of your mouth. So if you are waiting for anything in life, wait with a gracious spirit. Allow me a moment to share one of my experiences where I had to exercise patience. Last weekend I went to Wal-Mart and it was unbelievably crowded. I had no trouble getting the items I needed, but every aisle was extremely long. Anyone who knows me, knows I don’t like long lines. So I found a line and stood in it. It was so long I was in the clothing section with my shopping cart. My first response was to text my husband and my friends and start complaining, but I decided against it. Then I noticed my line wasn’t moving at all. So I said, “Great, I pick the line that’s not moving.” I began to have a talk with God while I was waiting which caused me to laugh. I said, “Hey Lord, since I’m waiting and I don’t have anywhere to go, I’ll just chat with you.” God reminded me I had some reading to finish, so I opened my bible on my cell phone and read my daily Psalm (if you are going to wait in line, might as well be productive). When I was finished, a sales associate walked up to me and said, “Mam, I see that you have more than 20 items, but if you follow me I will help you check out.” She escorted me to the 20 items or less aisle and told the cashier that I had more than 20 items, but please check me out. I went from standing in a line that wasn’t moving and still wasn’t moving to being escorted to the cashier and checked out. I said all of this to say, when God gives you an opportunity to exercise patience, make a conscious decision to talk to Him and see what He would have you do. You never know what door He will open for you once you pass the test. Good morning! Can I just say, the Lord is good and worthy of all the praise! Each day I fall deeper in love with God. He is a great God! 10 For a day in Your courts is better than a thousand. I would rather be a doorkeeper in the house of my God Than dwell in the tents of wickedness. As I marvel at God I can’t help but look at Psalm 84:10 with a new perspective. God is so good that I would rather be a doorkeeper in His house. When I read this scripture I began to smile because I get this and I believe this. See a doorkeeper by definition is someone who guards an entrance. A doorkeeper was looked at as the lowest position. You didn’t even enter the house you just watched over the entrance to check people coming in and going out. God is so awesome that I would rather guard the entrance to His home than to be partying all up inside of the house of the wicked. I don’t know if you are feeling like I am, but I would rather take the lowest position in the church and watch the door for the Lord. 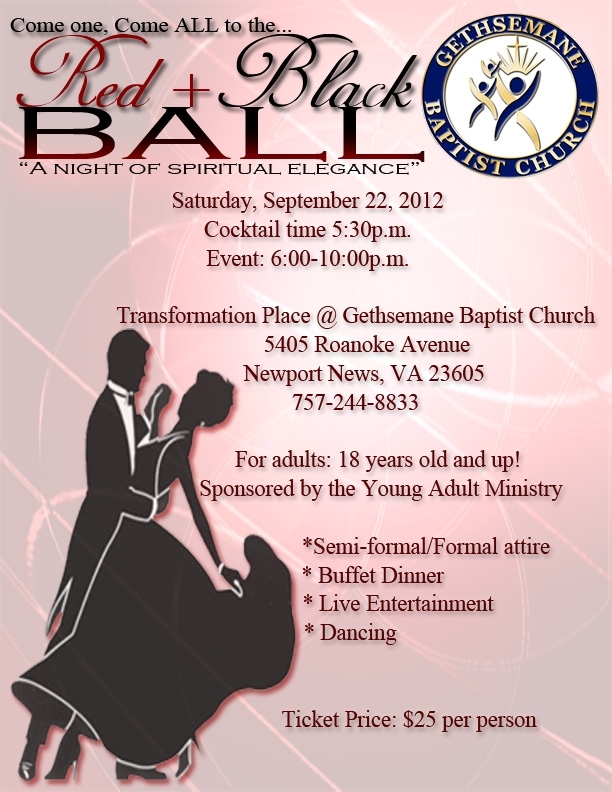 It’s not worth losing my soul to dwell in the house of the wicked when I can be a doorkeeper to the house of the Lord. I see that the world is selling some attractive things, but the catch is it will cost you your life. The world will make you think that you can have a grand life, but that grand life means you have to forsake the Lord. You can’t serve the world and serve the Lord, it doesn’t work. 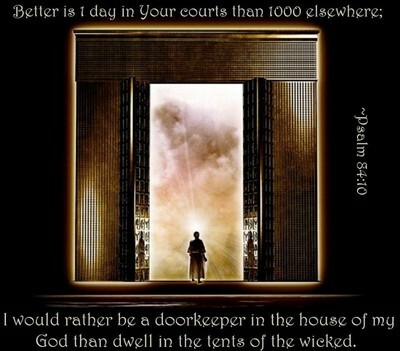 We have to make a choice, do we want to be a doorkeeper for the Lord or dwell in the tents of the wicked? Take a moment to examine your personal life and your spiritual walk. Some believers are dwelling in the tents of the wicked as we speak. It’s not too late for you to turn your back on the world and turn your face to God. Join me and be a doorkeeper. It’s the lowest position to the world, but it brings honor and glory to God. That’s what matters. Seek to please God and He will continue to bless you beyond measure.